I almost didn’t get in to kindergarten. I say almost, because obviously I would not be writing this if I hadn’t made my way through school. I went to school for many years, but that first fateful kindergarten round-up could have gone quite differently and put me on a different path with different teachers and different friends. Who knows? If I was held back that year, would I have made the same choices and become the same person? No one can say, but luckily, they let me in. Maybe, just maybe, in my time, parents listened to teachers more. I know my mother certainly thought what the teachers said was GOLD. 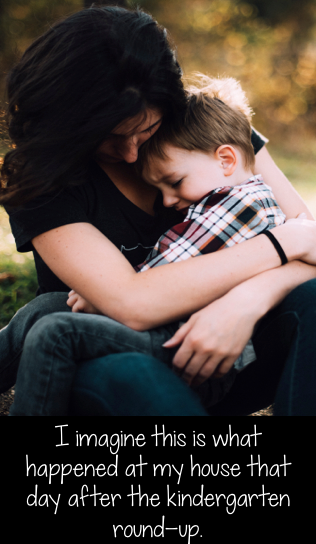 But… there were those moments when my mother challenged teachers, and that was huge, because she was the ultimate PTA mom, room helper, cookie baker, and best friend to all teachers. When my mama challenged you, it was about to get ugly. Well, the day of kindergarten round-up, I went to school with my mom. I’m the last of 4 kids, so everyone knew my family. My brother and sisters were all high-achievers, and the expectation for me to be as well was surely very high. However, as able as I probably was, I was TERRIFIED of strangers. I’m still very shy, but I wouldn’t say terrified. An extended conversation face-to-face with someone I don’t know still freaks me out, but I put on my big girl pants and get on with it. 1. Are they age appropriate? 2. Are we using follow-up questions to make sure kids don’t understand? 3. Could they be confusing to kids? 4. Is there another way to find out if kids can do the skill? 5. Is a child’s inability to do another task impeding his ability to show mastery of a certain skill? Now, for question 5, this one has been on my mind a lot lately. My son, who started reading Magic Tree House books in kindergarten, has always been a strong reader in English. 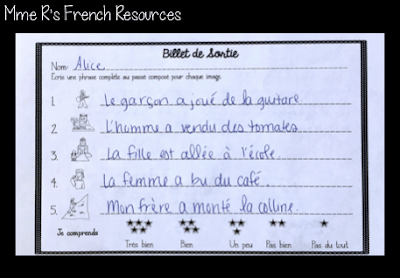 As a bilingual, he might read a little better in French right now, but as the skills are transferable, we work on reading skills often in both languages. We read every night and when he reads without me, he tells me all about Jack and Annie, the places they go, and the adventures they have. He can describe them in detail. So, as a certified English teacher who taught Communication Arts for 5 years, I was confused when his teacher reported that he does not understand setting. This guy can tell me, in detail, every aspect of setting from the story he just read. I know he gets it. Why doesn’t she? So, he came home last night with his assessment over setting. There was one question where students were asked to draw the setting. One. There were no more questions. Just that. Draw the setting. Well, I have a child who HATES to draw, so he halfway attempted a few stick figures standing in a few stick-like trees. He didn’t score so well. Another assessment, draw the character. Again, stick figure (this time of a teddy bear) and he got marked off because it didn’t LOOK like a teddy bear. Again, low score, because no effort is going to be put into drawing by him. We’ve talked about it, and I’ve explained that his teacher thinks he doesn’t understand, because he’s not showing it. He shrugs, says he can’t draw well and that this is a stupid way for her to see if he gets it. Wow! Straight from the mouth of a seven year-old. After looking at my son’s reaction, it’s clear to me that this isn’t really testing his knowledge of setting, but more his ability, or more accurately, his effort, to draw the setting. Is it possible that this isn’t a great way to assess all children? As a teacher, I would never assume to know what a teacher is doing in class, nor would I overstep my boundaries in the parent-teacher world and say a teacher is not doing a quality job, because that is just not fair. Should my son work harder to complete the expected task? Yes, he should, but I do think assessments should be geared towards assessing the actual skills we want to see rather than penalizing students for not being proficient at another task, such as drawing. I am fortunate enough to be an educator, so when I see things on my son’s report card that don’t seem right, I can further assess to see if he is proficient. If he needs improvement, we work on those skills. If he can show understanding and mastery in another way, I’m good with that. Sadly, grade cards and standardized tests reflect the understanding demonstrated by assessments that might not accurately reflect student understanding. As a teacher, I have asked kids to draw before. I don’t grade them on the drawing, of course, but I do ask them to show that they understand. It isn’t THE assessment, but it might be part of my toolkit to see if students get it. Now, as I’ve never taught first grade, I don’t presume to know what they can do to show understanding of setting, but I do know it is much less than the middle schoolers and high schoolers I taught. So, what would be a good way to assess here? I don’t claim to know much about our littlest learners, but I do know that we need to try different ways to figure out if kids get it. 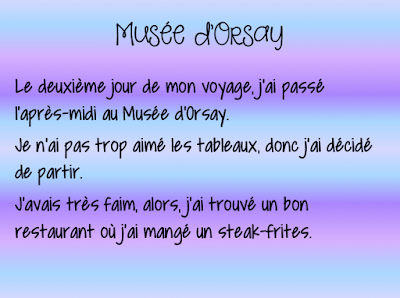 As I have spent the majority of my years teaching French, either as second language or as a dual language, I’d like to look at this from a foreign language point of view. Do I assess speaking and listening as much as reading and writing? Teachers who do this will often see that kids who aren’t the best spellers might actually learn aurally, so wouldn’t this be a great way to quiz vocabulary? How about following up a fun speaking activity with a speaking quiz? 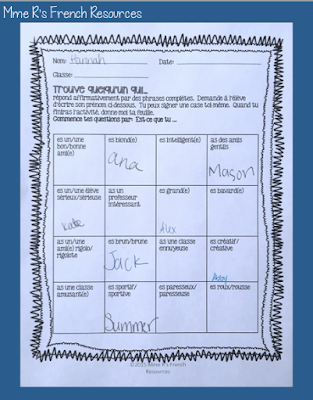 I have designed all of my Find Someone Who activities to be used as in-class activities, but each resource includes a follow-up homework and speaking rubrics so they can be used as interview-style speaking quizzes. 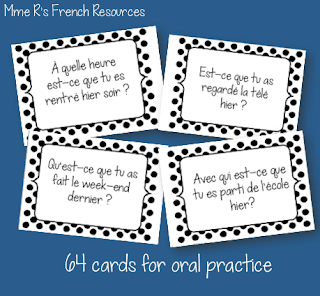 Related: Get your students speaking French! Do I provide choice with projects? If a student hates to draw, can they write about the topic? Or conversely, if a student hates to write, could we allow them to draw, or present, or make a movie about the topic? 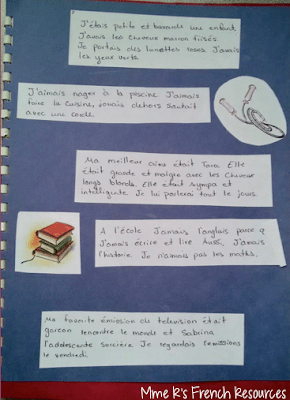 Here’s a glimpse at a project from a French 2 class that I love. Students write about themselves in the present tense, then write about their life as a child, then predict what their life will be like in the future. The writing is not perfect, but it is pretty good for a second-year student! In this project, students have a choice of the questions they will answer, which makes the project a lot more fun and interesting for them. When time allows, I have students read them to a small group or present them in class. 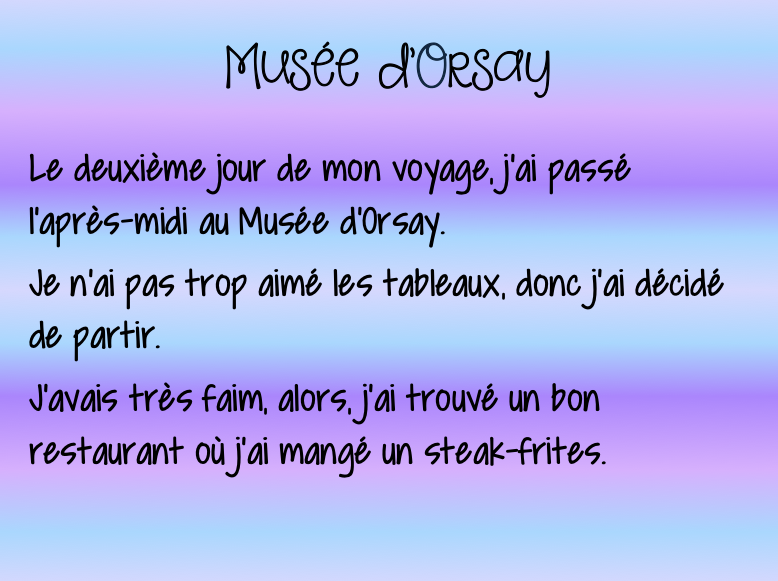 Click here to see this project in my Teachers Pay Teachers store. Do I vary my own teaching? I’m guilty! I love to read and write, and I hate to draw and speak in front of people. As a new teacher, I relied very heavily on written activities because they fit in my own comfort zone, but I was doing a disservice to my kids. Now, my classes are a mix of speaking, writing, moving, listening, acting, and so much more. I was hesitant to try new things, thinking the kids would hate them, but enrollment in my classes increased greatly when I did this, because kids spread the word : French class is FUN! Related : Learning a Foreign Language Should be Fun! Do I assess the same skill in a variety of ways? If you gave a written quiz, would you also follow it up with a speaking quiz or a presentation? If you asked kids to draw, would you also ask them to write about it? In order to really evaluate how well our students understand, we need to use a variety of ways to assess students, rather than relying solely on pencil and paper tasks that may not truly reflect their understanding. My grammar bundles include games, speaking activities and quizzes, guided notes, writing exercises, projects and/or oral presentations. There are so many ways to see if students are understanding, and the variety keeps students happy. 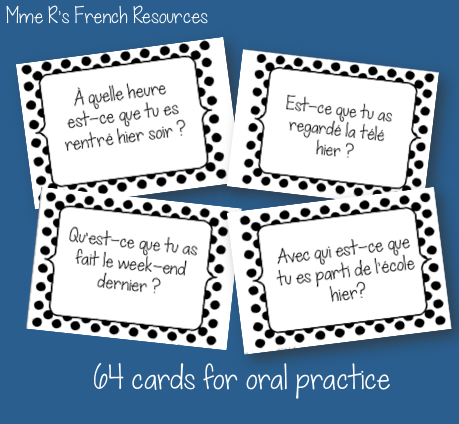 Here is a peek inside my passé composé bundle at few easy ways to assess students. 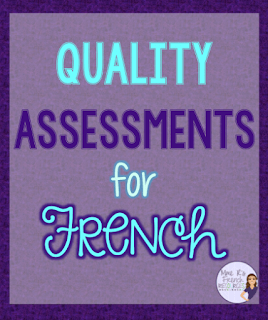 And of course, there is a standard grammar packet with pages of worksheets that will help your students practice and review the passé composé. Do I ask kids what they like? I know we have a lot on our plates. With constant paperwork, benchmarking, ever-changing standards, new students, new expectations, new….everything, a lot of us are just trying to get by. We can’t do it all, and we will burn out if we try. But, what if we tried, once per unit, to do a different type of assessment than the textbook-provided quiz? What if we asked students what they wanted to do and found a new, fun project instead of a test? What if we looked at how we balance assessments to see if we are relying too much on one set of skills? As teachers, we grow each year, and even as a veteran, my eyes were opened by my son’s assessment. I know I do a good job, but I know there is still so much more I could do, so I’m going to keep trying, and I’m going to keep getting better every year. What do you think? When are assessments just not good enough, and what can we do to really see if kids understand?